Fits HON lateral files produced before April of 1994. The ends of the rails look like an "L" shape and the slots in the sides of the drawers that accept the rails are a thin rectangular shape. Specify cabinet size: 30", 36" or 42" exterior width. Fits HON lateral files produced after April of 1994. The ends of the rails are more solid and have a small notch cut out to fit into the drawer slots. The slots on the side of the drawer that accept these rails are "b" and "d" shaped depending how you are viewing. Specify cabinet size: 30", 36" or 42" exterior width. Double Rail Hanging for Front-to-Back Filing in a 42" wide Hon file cabinet. 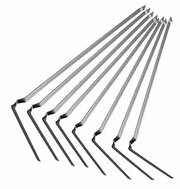 Overall Length is 15-1/2". 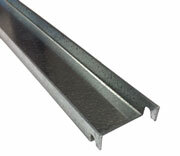 Single Rail Hanging for Front-to-Back Filing in a 30" or 36"" wide Hon file cabinet. 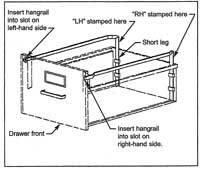 Overall Length is 15-1/2"
HON® Vintage Optional HON Hangrails for 500, 510 & 530 Series vertical cabinets produced prior to July 1, 1996 with low side drawers. •	Required for use of hanging file folders in file cabinet drawers. HON® Vintage Optional HON Hangrails for 300, 310 & 330 series vertical file cabinets produced prior to March 4, 1996 with low side drawers. HON® Vintage Optional HON Hangrails for 210, 250 series vertical file cabinets produced prior to July 1, 1996 with low side drawers. Will also work with the Hon 80 Series Veneer Desk File Drawers.